Fancy getting your hair styled for only Rs 65 by someone who goes to work at his barber shop in a Rs 3-crore Rolls-Royce Silver Ghost? Yes, this is the amazing rags-to-riches story of 41-year-old Ramesh Babu who made it big in this cut-throat world all on the dint of his honesty, hard work, humility and some foresight. Life wasn't always hunky dory for this man. He was only 7 years old when his father, P Gopal, a barber in Bengaluru, died. All he left behind was a barber shop: little did he know that his son would become a billionaire even before he turned 40. However, upon his mother's insistence, he resolved study up to the pre-university level and then obtained a diploma in electronics. All this while, his father's shop was still being rented out for meagre amounts. He then decided to run it himself and in 1989, he began working at the salon that had first been established by his grandfather. His barber shop -- Inner Space -- did well enough for him to be able to not just look after his family's needs, but also to save some money. By 1994, Ramesh had saved enough to buy a Maruti Omni. He bought it for personal use, but it "used to lie idle most of the time" so he decided to put it out on rent. And that was the seed that later bore fruit and turned into his new company Ramesh Tours and Travels. Between 1994 and 2004, he bought seven more cars and rented them out too. He ensured that his drivers were well behaved and his clientele happy. Sampath was his first driver and he still works for Ramesh. Ramesh had a small office till then. In 2004, he decided to enter the luxury car segment. 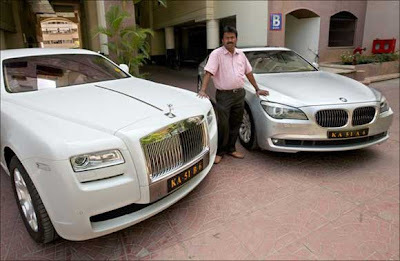 He bought a Mercedes Benz for a cost of Rs 42 lakh (Rs 4.2 million). He took a loan from the bank for this. "It ran very well because other travel agencies with the same car used old cars. We were the only ones who used a brand new car." From then on, it was a one-way street to success for Ramesh. He now owns 90 cars in all, most Toyota Innovas. His fleet of cars also includes 27 luxury vehicles: from Mercedes to BMWs to a white Rolls-Royce Ghost. He actually needed a paper and pencil to count the number of cars he owns. Ramesh Babu has a barber shop and a booming car rental business in Bengaluru, but still prefers to cut hair so that he never forgets his humble beginning.